Mazda must be furious, but it’s almost entirely the BBC’s fault. Let me explain, plus show you all the details of this 28.5 liter monster Fiat that will do runs up the hill all weekend long, or until ours ears bleed out. Mazda spent its money the right way by sending two race cars sky high in front of Lord March’s humble home. Indeed it does. It’s awesome. The problem is that the Beast of Turin still tops it, so everybody is checking that out at the moment instead of looking at Mazda’s statue in the background. 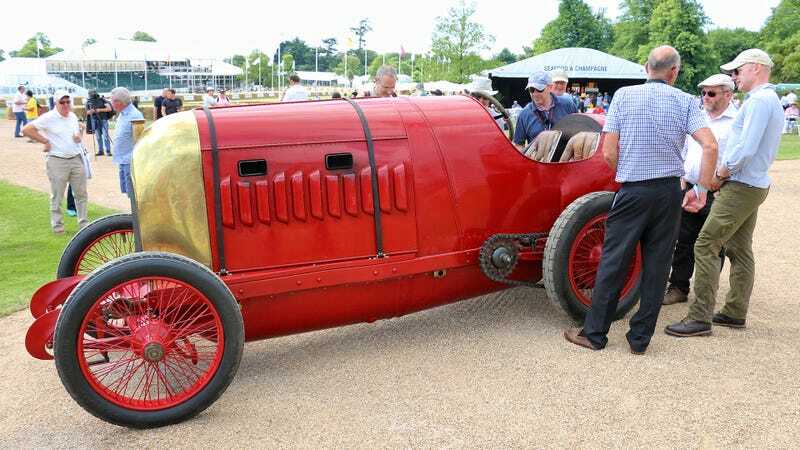 The BBC asked for the car to be parked in front of the house for their morning show, but by the time they finished the shooting, the Beast of Turin got stuck as the race marshals shut down the road leading back to the paddocks.